In the absence of an understanding of the meaning of dementia patients' behaviors, health care teams struggle to create appropriate nonpharmalogical interventions that properly address patients' needs. LuBAIR scale can help identify problems underlying dementia behaviors. The presence of behaviors in dementia and major neurocognitive disorder (D/NCD) significantly raises caregiver burden and subsequent burnout. These behaviors make it difficult for individuals to be accepted into care facilities, and yet there are insufficient supports available in the community for caregivers. Furthermore, there are suboptimal medical and behavioral interventions available for managing behaviors in dementia, both in the community and in care facilities. The reasons for suboptimal treatments are complex. However, all published literature points toward understanding the reasons for and meaning underlying the presence of behaviors in order to develop optimal treatment interventions. A new clinical paradigm with novel terminology and classification is being proposed to accomplish the aforementioned goal. In the Diagnostic and Statistical Manual of Mental Disorders, 5th Edition (DSM-5), the official classification of dementia is "major neurocognitive disorder. "1 In the early stages of dementia, evidence-based pharmacological interventions are available in the form of cognitive enhancers that slow the progression of the disease, preserve functions, and delay the emergence of neuropsychiatric and neurobehavioral symptoms. As long as a patient is able to engage in a valid clinical interview, provide a reliable history, and participate in a mental status examination, clinical disorders can be determined using DSM-5 criteria. Such is the case in early to mild stages of D/NCD. However, as the reliability and validity of the information obtained from the patient interview diminish, as is the case in moderate to advanced stages of D/NCD, it becomes difficult to diagnose specific neuropsychiatric disorders using DSM-5 criteria. Behavioral and psychological symptoms of dementia (BPSD), which is equivalent to "behavioral symptoms of neurocognitive disorder" in DSM-5, is a diagnosis of exclusion. All separate and discrete mood, anxiety, and psychotic disorders; delirium; and other comorbid psychiatric disorders must be excluded in order to rule in BPSD. With the progression of D/NCD into moderate to severe stages, the reliability and validity of information obtained from the patient is severely compromised. There is increasing reliance on information from collateral sources and observational data. Furthermore, it is in the moderate to advanced stages of D/NCD that the prevalence of BPSD is the highest, reaching up to 90% in this patient population. Several standardized scales have been used to distinguish among different comorbid psychiatric syndromes in patients with moderate to advanced stages of D/NCD. Examples of these include the Confusion Assessment Method, Cornell Scale for Depression in Dementia, and Neuropsychiatric Inventory.2 Review of the literature clearly identifies that none of the above scales has an established validity and reliability in patients with moderate to advanced stages of D/NCD. Furthermore, all of these scales depend on the patient to engage in a reliable and valid clinical interview to diagnose psychiatric comorbidities, presenting a challenge in patients with moderate to advanced stages of D/NCD due to their severe impairment in memory and language functions. There are currently no clinical tools available whose reliability and validity has been established for moderate to advanced D/NCD. As a consequence, specific clustering of individual clinical symptoms, which are either consistent along temporal timelines or respond to a common therapeutic intervention, have yet to be identified. This is a primary and essential step in the identification of syndromes in any medical disorder in order to develop novel treatments. Attempts have been made to discern syndromes using standardized tools such as the Behavioral Pathology in Alzheimer's Disease (BEHAVE-AD) and other established scales.3 Several clusters of symptoms have been identified using these scales. However, none of the symptom clusters identified has shown a response to a common therapeutic agent, thereby failing to qualify as a syndrome. As a consequence, minimal progress has been made in developing overall effective pharmacological interventions in the management of BPSD. There is evidence to support a small set of individual symptoms of BPSD responding to pharmacological treatments. However, the risks to the patient from the use of medications often outweigh the benefits. Consequently, all best practice guidelines recommend the use of medications only sparingly and typically for short durations. The use of nonpharmacological treatments as first-line intervention is more consistent with the first principle of medicine: primum non nocere (first, do no harm).2 Consequently, nonpharmacological interventions are considered the gold standard first-line intervention for managing BPSD. Unfortunately, the evidence for effectiveness of nonpharmacological interventions is not robust and such interventions are extremely expensive to sustain. Furthermore, the skill set and training required to implement nonpharmacological treatments successfully are not readily translatable into everyday clinical practice, and the cost of implementing such a level of training is prohibitive. The incidence and prevalence of D/NCD is on the rise in the westernized world and is in keeping with the inverse pyramid of population demographics. The financial burden of caring for D/NCD patients will increase exponentially over the next two to three decades as the baby boomers age. Hence, to have minimally effective pharmacological treatment and expensive and unsustainable nonpharmacological treatment for the management of BPSD is simply an unacceptable state of clinical affairs, especially when up to 90% of the patients who go on to develop D/NCD will exhibit BPSD. We have yet to fathom the consequences of the "Silver Tsunami." All published literature identifies the need to develop clinical paradigms that will assist in understanding the meaning for the presence of behaviors in patients with D/NCD. Understanding the meaning of behaviors has been determined to be the essential step required to make substantive progress in the assessment and management of BPSD. With this as the identified goal, guidance was sought from existing published literature in an attempt to determine the reasons for the identified gaps in the current understanding of behaviors, and to develop a novel approach to labeling and classifying behaviors in moderate to advanced stages of D/NCD to better understand the meaning of these behaviors. The initial approach involved review of literature from the last three decades on the existing terminology and models put forth in understanding the presence of behaviors in D/NCD. Inconsistencies in definitions of existing terminology and the heterogeneous application of terminology for the same sets of behaviors in different clinical contexts were highlighted. Furthermore, all published models for understanding the occurrences of behaviors in patients with D/NCD were dichotomized along biological or psychosocial paradigms. A comprehensive biopsychosocial (BPS) model has yet to be developed. Acknowledging these deficits and adhering to the basic academic definitions of Reference Terminology and Classification Systems,4 the following approach is being proposed as a way forward. • environmental factors (milieu structures and interpersonal interactions). • specification of the construct of the category or domain. The criteria and format were chosen due to relevance in classifying behavioral symptoms in D/NCD and widespread acceptability. They are commonly cited and used in research regarding behaviors in persons with D/NCD or related mental health disorders. • heterogeneous group of behaviors. Two behavioral categories emanating from pathological changes in information processing theories are disorganized behaviors and misidentification behaviors. Four behavioral categories emanating from pathological changes in theories of motivation and needs-based theories are apathy behaviors, goal directed behaviors, motor behaviors, and importuning behaviors. Three behavioral categories emanating from pathological changes in theories of regulation of emotions are emotional behaviors, fretful/trepidated behaviors, and vocal behaviors. Two behavioral categories emanating from pathological changes in theories of compliance and aggression are oppositional behaviors and physically aggressive behaviors. Two behavioral categories in the heterogeneous group are vocal behaviors and sexual behaviors. For this last group, no singular specific theoretical construct could account for the heterogeneity of symptoms found in these behavioral categories. It required every single specification of theoretical construct identified to account for the various subtypes of vocal behaviors and sexual behaviors identified in this new classification. LuBAIR scale has been evaluated against existing reliable and valid behavioral assessment scales, including the Cohen-Mansfield Agitation Inventory6 and BEHAVE-AD.3 The Pittsburgh Agitation Inventory7 was used as the screening tool for inclusion criteria for the reliability and validity study. LuBAIR scale was determined to have comparable reliability and validity to the existing scales, is more comprehensive in data collection, and allows for behaviors to be categorized in clinically meaningful ways, thereby allowing for an understanding of the meaning of patient behaviors. These results are being compiled and a manuscript has been written for imminent submission for publication to a peer-reviewed journal. The first step in the use of LuBAIR scale is to review clinical records of a patient referred for evaluation and identify all behavioral symptoms documented. Each identified behavioral symptom is then matched to the most appropriate behavioral category on the scale. This step identifies the quality of behaviors present in the index patient. The second step is to follow the identified quality of behaviors over the subsequent week to determine the severity of each quality of behavior. There is currently no consensus definition on rating the severity of behaviors in care settings. In other scales, the degree of caregiver burden is used as the measure of rating the severity of behaviors for patients residing in the community. With LuBAIR scale, the severity of the behaviors is determined by the response of each behavior to interpersonal interventions (IPI), regardless of the patient's place of residence. The severity of the behaviors is rated as 1 if he or she responds to IPI (sustained response to IPI). The severity of the behaviors is rated as 2 if he or she initially responds to IPI but relapses once IPI is withdrawn (unsustained response to IPI). The severity of behaviors is rated as 3 if he or she does not respond at all to IPI. The third step in the use of this scale is to transfer the behavioral categories identified onto the Dementia Observational Scale, also referred to as the Q15 minute observation scale. This will provide the frequency and duration of each identified quality of behavior. Hence, the clinical application of LuBAIR scale results in behaviors being evaluated along the following constructs: 1) quality of behaviors, 2) frequency and duration of behaviors, and 3) severity of behaviors. The next step in clinical applicability of LuBAIR scale is to evaluate specific risks associated with each quality of behavior identified. Existing literature provides minimal direction on defining specific risks in context of behaviors in D/NCD. Mental health statutes of "risk of harm to self or others" are often applied to evaluating behaviors in D/NCD. In the clinical application of LuBAIR scale, an attempt has been made to define risks associated with each quality of behavior in the context of D/NCD care. All care planning to mitigate risks can be done in an adequate manner only after identification of such specific risks. All the aforementioned clinical principles used with LuBAIR scale have been compiled in a clinical handbook, which will be submitted for publication to Aging & Society in the near future. Optimal treatment for all medical disorders always involves the best balance of pharmacological and nonpharmacological interventions. The ultimate goal of the published textbook The Meaning of Behaviors in Dementia/Neurocognitive Disorders: New Terminology, Classification, and Behavioral Management2 and the clinical handbook to be published in the future is to help care professionals develop safe and effective pharmacological treatments and more sustainable and inexpensive nonpharmacological treatments to manage behaviors in patients with moderate to advanced stages of D/NCD. The author has been using these principles in clinical practice at Homewood Health Centre, Guelph, Ontario, Canada, for several years, and the results of this naturalistic study are currently being evaluated. Preliminary results show great promise in that risks associated with behaviors were optimally mitigated while preserving cognition and function, accomplished through the use of balanced pharmacological and behavioral interventions. — Atul Sunny Luthra, MD, MSc, FRCPC, is an associate clinical professor at McMaster University in the department of behavioral neuroscience. He is affiliated as a research scientist with the Research Institute for Aging, Schlegel-University of Waterloo. He serves as medical director of the Program for Older Adults at Homewood Health Centre and the St. Peter's site of Hamilton Health Science. His clinical and research focus lies in developing safe pharmacological and affordable nonpharmacological treatment interventions for behaviors in moderate to advanced dementia. 1. American Psychiatric Association. Diagnostic Criteria From DSM-IV-TR. Amer Psychiatric Pub Incorporated; 2000. 2. Luthra AS. The Meaning of Behaviors in Dementia/Neurocognitive Disorders: New Terminology, Classification, and Behavioral Management. 1st ed. Champaign, IL: Common Ground Publishing; 2014. 3. Reisberg B, Auer SR, Monteiro IM. Behavioral Pathology in Alzheimer's Disease (BEHAVE-AD) Rating Scale. Int Psychogeriatr. 1997;8(S3):301-308. 5. Davis LL, Buckwalter K, Burgio LD. 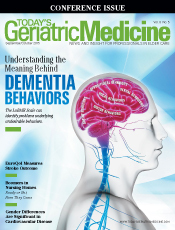 Measuring problem behaviors in dementia: developing a methodological agenda. ANS Adv Nurs Sci. 1997;20(1):40-55. 6. Cohen-Mansfield J. Assessment of disruptive behavior/agitation in the elderly: function, methods, and difficulties. J Geriatr Psychiatry Neurol. 1995;8(1):52-60. 7. Rosen J, Burgio L, Kollar M, et al. The Pittsburgh Agitation Scale: a user-friendly instrument for rating agitation in dementia patients. Am J Geriatr Psychiatry. 1994;2(1):52-59.